Throughout the Middle Ages, reliquaries were typically the special domain of the goldsmith, the artisan whose work was three-dimensional, architectural, and precious. By the fourteenth century, however, the development of gold-ground painting in Italy and the widespread circulation of relics in Europe gave rise to new categories of sacred containers. Particularly in Siena, renowned for its goldsmiths, enamelers, and painters, a variety of novel reliquary forms emerged. The incorporation of sacred relics into panel paintings, particularly those featuring Marian imagery, responded to the devotional requirements of both private and institutional patrons. The producers of these objects relied on materials traditionally associated with panel painting, but borrowed their forms and their visual language from works in other media. Naddo Ceccarelli, a talented follower of Simone Martini (ca. 1284–1344), was one of a handful of Sienese painters to create reliquaries that emulated the work produced by goldsmiths. Their work combined the display functions of reliquaries with the devotional imagery associated with sculpture and painting. 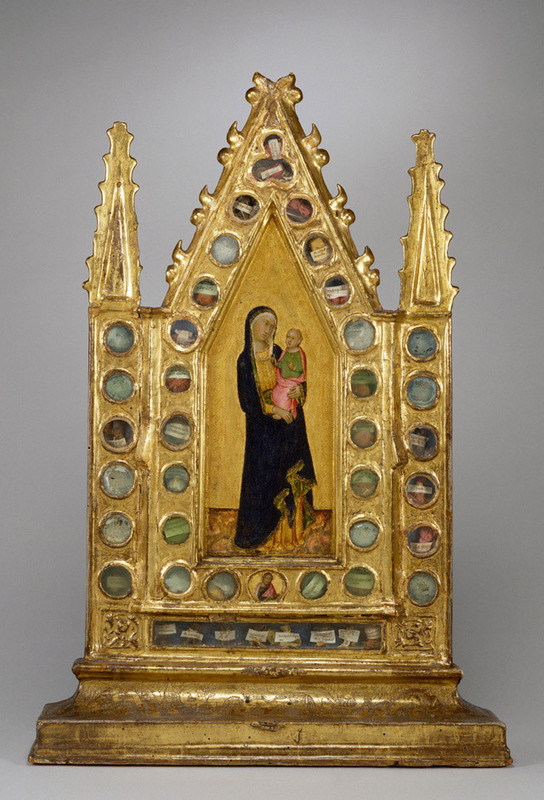 In this object, Ceccarelli has set a delicately tooled image of the standing Virgin and Child within an armature punctuated by thirty-four clear glass relic chambers. The glimmering gold-ground painting at the core of the object constitutes one of the few surviving examples of a full-length, standing Virgin and Child in fourteenth-century painting. This particular genre of Marian iconography is more commonly found in freestanding sculpture. Standing on a faux-marble platform, Ceccarelli's Virgin recalls the placement of Marian statues above altar tables. The presence of the rectangular relic chamber below the painted marble surface enhances this association with an altar table, which was required by canon law to contain relics. By combining these elements in his painted tabernacle, Ceccarelli presented worshipers with the miniature equivalents of the furnishings of a funerary chapel complete with statuary, altar, and relics. Provenance: Arnold Seligmann, Rey and Co., New York (date and mode of acquisition unknown); Henry Walters, Baltimore, 1920, by purchase; Walters Art Museum, 1931, by bequest.